Many women get excited about their pregnancy at this stage, as their lovely round bump really starts to show. Tell your midwife or doctor if you have any worries about your baby or the size of your bump – they can help to reassure you. Maternity clothes or looser clothes might be the go if your normal clothes don’t fit anymore. Most of these pregnancy health problems can be managed quite well – ask your doctor or midwife for information. If haemorrhoids are bothering you – itching or burning – increase the fibre in your diet and drink more water. It’s also a good idea to do more light exercise. Exercise can help to reduce constipation, which makes haemorrhoids worse. Also discuss the problem with your health professional, who might be able to suggest a treatment. Some stress in pregnancy is normal, but severe stress or stress that goes on for a long time isn’t good for you or your baby. Stressful events like relationship break-ups and violence can have an impact on your pregnancy and wellbeing. If you feel very stressed, talk with your doctor or midwife at your pregnancy appointments, or call Lifeline on 131 114 or Beyond Blue on 1300 224 636. It’s a good idea to discuss the things you could be stressed about with someone you trust. To reduce the effects of stress, it can help to learn more about the first few months with your new baby. You can learn by going to birth or parenting classes, talking to your midwife or doctor, sharing information with your partner, family or friends and looking at the information on this website. You can also call the Pregnancy, Birth and Baby hotline on 1800 882 436. Antenatal, childbirth education or prenatal classes all mean the same thing. These classes give detailed information to help you and your birth partner get ready for pregnancy, labour, birth, breastfeeding and early parenting. Even if you’ve done a lot of research online or talked to others, at antenatal classes you can talk to an expert (usually a midwife) about your questions and concerns. Antenatal classes are also a great chance to meet other expectant parents. You can usually do antenatal classes over several weeks on weeknights, or you might have the option of doing a weekend class. Classes can fill up quickly, so ask your midwife or doctor about making a booking in early pregnancy. You can do other private classes, like active birth, hypnobirth and calm birth. If you’re interested, look them up online to see whether they’re offered in your area, or ask your doctor, obstetrician or midwife for more information. 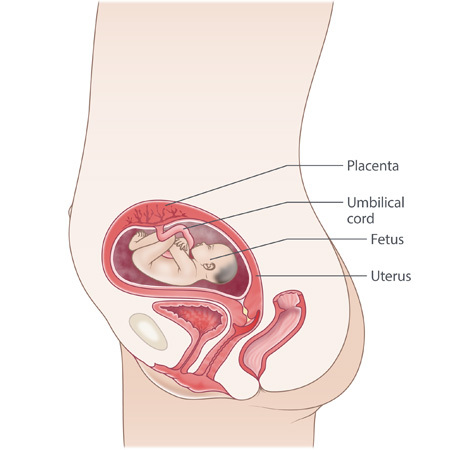 Your baby is about 19 cm from head to bottom, and weighs around 460 gm. Your baby’s inner ear is adult size. The retinas of your baby’s eyes are fully developed. Your baby is moving around a lot, because there’s still plenty of room. Your baby’s preferred position is probably ‘transverse’ – lying across your tummy – but it will be changing position all the time.